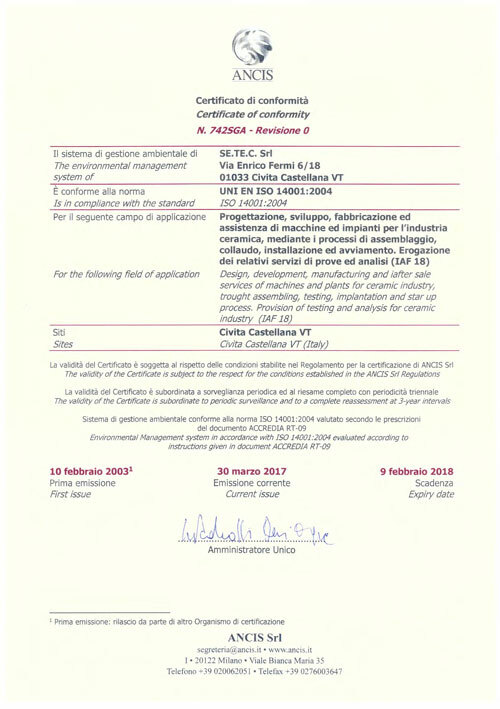 The SETEC GROUP, considering the improvement of the quality of its products and services as a central commitment for increasing customer satisfaction, has already used a Quality Management System in compliance with the UNI EN ISO 9001: 2008 standard, integrated with the Environmental Management System UNI EN ISO 14001: 2004, trying to rationalize and harmonize its organization and its methodologies in order to make them compatible with the standards for quality. At the same time, through the Environmental Management System, it expresses its responsibility towards the environment and extends it in a binding manner to all company employees in such a way that a product is always supplied at the highest levels of quality while respecting the protection of the heritage environmental and safety of employees and customers. 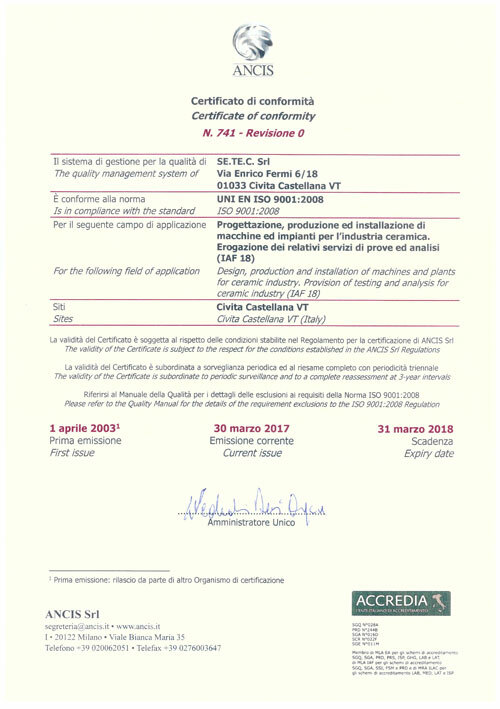 In particular, the Management has given full responsibility and autonomy in the design, implementation and control of the Quality Management System (QMS) to Ms. Stefania Blanchi, who assumes the role of Head of the Quality Management System (RGQ) . With regard to the Environmental System, the Management gives full responsibility and autonomy in the design, implementation and control of the System to the Dr. Elisabetta Martini, who assumes the role of Head of the Environmental Management System (RSGA), under the coordination and direction of the Manager of the Integrated Management System (RSGI) and Management Representative.